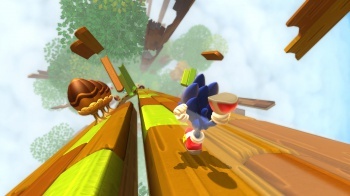 The game is separate from the previously announced Sonic Boom. Earlier in the year, Sega announced Sonic Boom, a new Sonic title that takes some... artistic liberties from what fans have expected from the series. Sonic Boom is being developed by Big Red Button though, and not the core Sonic team that brought us Sonic: Lost World last year. Team Sonic's Takashi Iizuka has now told Japanese outlet 4gamer that his team is, in fact, working on its own new game, completely separate from Sonic Boom. "At the moment, the core Sonic team at Sega is working on a new title that will use the traditional look and mechanics of the series, which will get more details later during the year," said Iizuka, which i'm sure Sonic fans will be glad to hear. As for Sonic Boom, he explained that, "At the same time, Big Red Button, an entirely new studio, is working on a new version of the entire game universe, called Sonic Boom," adding that it "is designed to accompany the delivery of a new range of toys and a new cartoon series." So in short, he has basically told us, "Don't worry about Sonic Boom, that's just there to sell toys and cartoons. You'll get a proper Sonic game later." Sonic Boom will release on the Wii U and 3DS in 2014, and last we heard, a "Next-gen" Sonic title was rumored to be scheduled for 2015, which might just be the new title Team Sonic is working on. Sonic: Lost World recently got some rather cool, completely free Zelda DLC. Sonic team has proved time and time again that the last thing that they should be working on is another Sonic game. At best their games are only okay and other times they spit in the fans hopes and dreams for a good Sonic game. They should just try their hand at a different genre or franchise, make a game that doesn't restrict them into the "gotta go fast" style of gameplay that Sonic games have to be, and let another team work with the blue hedgehog for a little while. I can only see problems from developing these games side by side; there will be less money for the two to work with in the long run and developement will be cut shorter than it needs to be for at least one of those games. Sheesh, why does everyone flip the hell out at the first sight of change? I signed into my account which I rarely do because I am lazy just to say this. Seriously I like the Sonic The Hedgehog games and will admit despite Lost World having so many game play problems if they had announced another regular Sonic game instead of Boost I would have gone "okay, cool I will play it" but to announce Boost and make use think they are finally giving Sonic a change, they announce a new old game because that is what us fans want. You act like Sonic is just fine when the games have massive problems. Why could you not just have waited a year or so let Boost come out. See what happens and then announce a classic style game and use the time to make it good. Something about this announcement just sounds cheap. Like Sega was afraid if we did not know Sonic was getting a regular game all the players would just forget he ever existed. I really don't care about aesthetics of the characters too much. I just want the gameplay to be good. The biggest problem Sonic games have been having is shoving too many half-hearted gameplay styles into a single game and forcing you to switch constantly. Stick to one cohesive game style. Don't shove a brawler and a 3D platformer into the same game. Don't shove in vehicle sections unless it's a racing game. Don't shove in a 2D platformer and a 3D Quicktime Event game together. As for flipping out at the first sign of change. Well, sometimes change happens for the sake or it or people/fans view it as unnecessary (Eg. Say Removing manual targeting from your game when before it was there). Basically, it's just the fact people get antsy before they see something in action. ...Or it could just be the sonic fandom being the sonic fandom, take your pick. I don't know why Sonic Adventure 2 Battle was so good and/or why they haven't been able to reproduce that effort since. Releasing Sonic Adventure 2 Battle on the PSN was the worst move they made because now I'll never need to buy another Sonic game. 'cos they don't know when to quit! But honestly, I don't really expect this to go anywhere. It might have good previews, but it'll release to the same mediocre reviews and general reactions. "Don't worry about Sonic Boom, that's just there to sell toys and cartoons. You'll get a proper Sonic game later." That's one way to make people decide not to buy either. The "traditional look and mechanics of the series"? Didn't they use that enough with Sonic 4, half of Generations, and in 3D with Lost World? If the game is going on the newest hardware, then wouldn't it make sense to show off how it can show truly Sonic speed in 3D? Ah, well. At least we have the PC version of Generations, which has a good modding scene. Sonic Boom isn't "proper" and is "just there to sell toys and cartoons"? I hope that is an underestimation. Between Sonic Boom and The Amazing Spider-Man 2, I'm hopeful that tie-in games will be about as good as AAA games. But i dont expect that anytime soon. And yet for some reason I'm way, way, way more exited for Sonic Boom. As a fan of the old fan of sonic games and a fan of the kinds of games they should be today (Cloudbuilt, Mirror's Edge, etc.) I have to say that I just want Sonic Team gone. I know they're really emotionally invested in Sonic but he deserves better than them. Seriously, Sonic Team probably shouldn't even be trying to make 3D games since they're obviously not very good at it, having made loads and loads of bad ones for a few OK to good ones. I want Sega to take the IP and give it to someone who will finally put it into a runner so Sonic can make the transition to 3D that he always deserved. You know what they're called in Japan? To the point, this is going to end in blood, tears, lost jobs and continued disapointment... and maybe this time, it'll finally drive Sonic Team bankrupt (let's call it a... mercy kill). "Don't buy this next Sonic game, because it'll be just another cash-in on the dwindling Sonic name. What you want to do is buy the NEXT Sonic game, which will be just as bad, but hey, we made it for you... the fans. We hate you as much as you hate us." I actually thought Sonic was making a comeback for a while. Colors and Generations were actually pretty great games, so I was pretty excited to play Lost World... but I wasn't even disappointed. When I played the game, it just made sense that it was as bad as it was. I wasn't sure what else I was expecting. That's the state of this franchise. I personally feel that Sonic Team can make a good 3D Sonic game. I'm glad that they're straying away from the bland 2D atmosphere. It just doesn't work at all. People should get out of the past and have an open mind for once. You wouldn't feel that way if you'd just have an open mind. 1991 is over and 2D is obsolete. That's just the way it is. I'm going to be the...what is it called when you are the only positive one in a sea of dislikers? Anyways, I honestly enjoyed Sonic Generations. It wasn't perfect, and was definitely way too short and easy (unless you go for 100% completion). That said, it was still a solid game, and had enough charm to make up for its shortcomings. While Sonic Boom doesn't exactly light me up, the idea of another Sonic game by the people who brought us Generations makes me want to hear more. Call me...cautiously excited. OT: Uh... Yeah... I'm not going to pretend that I care enough say "Woo hoo" and all that jazz... So, I'll just leave this prediction here and you guys over at Sonic Team can agree to disagree with me, okay? Also, I CAN'T WAIT until the new Sonic show comes out on Cartoon Network! Dare I say I'm waiting for that more than the next "core" Sonic game? Or would not be too harsh of a textual burn?